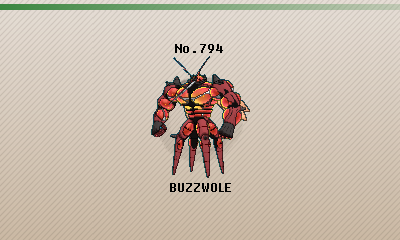 Buzzwole, The Swollen Pokémon. This Ultra Beast appeared from another world. It shows off its body, but whether that display is a boast or a threat remains unclear. A mysterious life-form called an Ultra Beast. Witnesses saw it pulverize a dump truck with a single punch. Although it’s alien to this world and a danger here, it’s apparently a common organism in the world where it normally lives. Buzzwole goes around showing off its abnormally swollen muscles. It is one kind of Ultra Beast. Buzzwole's thick physical defense combined with its typing allows it to perform as an outstanding physical wall checking the likes of Garchomp, Tapu Bulu and Kartana. A solid Bug/Fighting type grants Buzzwole with some nice resistances and its excellent Attack stat allows Buzzwole to dish out strong attacks even without a significant investment. Its movepool is also excellent and has great options such as Roost, Drain Punch, Bulk Up, Ice Punch, Focus Punch, etc. One of its biggest downsides is its mediocre special bulk which means that any strong special attack will pretty much OHKO it. Its poor speed tier also means that Buzzwole is easily preyed upon by faster Psychic and Fairy types such as Mew and Tapu Koko. A very high base 139 Attack & Defense makes Buzzwole a formidable physical powerhouse. Base 107 HP complements greatly its physical bulk while its Attack stat prevents him from being passive. Bug / Fighting is a good defensive typing which grants it resistances to common attacking moves such as Fighting, Bug, Grass, Dark & Ground. Combined with its Defense, it can take on foes such as Tapu Bulu, Lucario, Garchomp & Kartana. Beast Boost is an excellent ability as it can increase Buzzwole's Defense or Attack stat depending on the set used. A varied movepool allows Buzzwole to pull off many sets while having access to reliable STABs like Leech Life, Drain Punch, Hammer Arm, Focus Punch, Roost, Bulk Up, Ice Punch, etc. A completely mediocre base 53 Special Defense means that Buzzwole will pretty much be OHKOed by any super-effective special attack. Buzzwole's base 79 Speed is below average and leaves Buzzwole outsped by many Pokemon such as Mega Charizard Y, Tapu Lele, Ash Greninja, Heatran, Mew and Tapu Koko. A 4x weakness to Flying still hurts Buzzwole massively as Pokemon such as Mega Pinsir or Tornadus-Therian can easily force it out. Buzzwole's great physical bulk and excellent Attack makes it an ideal candidate for Bulk Up as it increases its two best stats while making it a potent sweeper once its checks have been removed. Roost complements Bulk Up by increasing its longevity granting Buzzwole more opportunities to set up and keep checking the physical threats it forces out. Drain Punch is Buzzwole's main STAB and it allows it to dish respectable damage while healing back the damage, potentially saving Roost's valuable PP. Finally, Ice Punch is used as the coverage move of choice to hit Landorus-Therian and Gliscor for super-effective damage. 112 Speed EVs are required to outspeed Tyranitar while the remaining EVs are spent in HP & Def to allow Buzzwole to check the most dangerous physical attackers such as Mega Scizor, Kartana, Garchomp and Tapu Bulu. Beast Boost is Buzzwole's only ability and it allows him to increase its Defense for every KO it obtains making it harder to take down from the physical side. Leftovers is the ideal item to grant Buzzwole additional recovery alongside Drain Punch & Roost. Substitute is the draw of this set as it allows Buzzwole to protect itself from status ailments and react accordingly to the opponent's switch-ins. Ice Punch is Buzzwole's best weapon to use against Landorus-Therian and Gliscor, with both taking a big chunk of damage if Buzzwole is behind a Substitute. Leech Life is used as the recovery move of choice allowing Buzzwole to replenish the HP lost while providing it with a strong STAB capable of heavily damaging the Psychic types that resist Focus Punch such as Mew, Reuniclus and Tapu Lele. 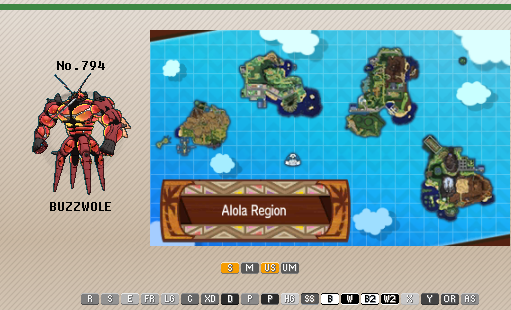 On the other hand, Earthquake allows Buzzwole to 2HKO Toxapex and beat it 1v1. Finally, Focus Punch is Buzzwole's main STAB and it deals a huge amount of damage once behind a Substitute. 196 HP allows Buzzwole to create 101 HP Substitutes which prevents Pokemon like Chansey from breaking them with Seismic Toss. 112 Speed EVs guarantees that Buzzwole will outspeed Tyranitar while 12 SpD prevents Toxapex from breaking Buzzwole's Substitute with Scald. The rest is dumped in Attack for maximum power. Beast Boost is Buzzwole's only ability and it complements this set perfectly due to the offensive nature of this set as it increases its Attack for every KO. Leftovers is the crucial item on this set as it grants some recovery replenishing the lost health from Substitute in combination with Leech Life or Roost. Buzzwole can use a choice set with a Choice Band to deal huge amount of damage. However, due to Buzzwole's low speed, this makes it difficult to use compared to other Fighting types. Poison Jab hits Fairy types quite hard to hit Fairy types on the switch. Buzzwole can use Stone Edge to destroy Volcarona and Mega Charizard Y on the switch, but it leaves Buzzwole vulnerable to Gliscor & Landorus-Therian without Ice Punch's coverage. Low Sweep is an option to reduce the opponent's Speed but offers very little outside that and Buzzwole prefers the additional recovery from Drain Punch or the extra power from Hammer Arm / Focus Punch. Fairy types are a huge pain for Buzzwole. Thanks to their typing, they resist Buzzwole's STAB combination and they won't take a lot from Ice Punch. Tapu Koko, Tapu Lele and Tapu Fini all outspeed Buzzwole and easily force it out with their super-effective Fairy STABs. However, they must watch out for the rare Poison Jab which can hurt them badly. Similarly, Psychic types such as Mega Alakazam, Mew and Latios can also OHKO Buzzwole with their STAB Psychic, however, they have more trouble switching into it as they can be hit quite hard by Leech Life. Flying types like Tornadus-Therian, Mega Pinsir and Landorus-Therian can exploit Buzzwole's x4 weakness and destroy it with their STABs, but they must be wary of Ice Punch. Residual damage from entry hazards, weather, and poison all stack up quickly and can severely cripple Buzzwole, especially poison since it ruins its durability throughout the match. 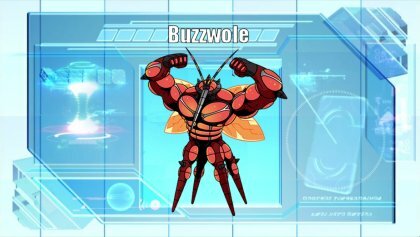 Buzzwole has made an appearance in the anime. In its appearance, one fell out of the Ultra Wormhole and started leeching life from various Pokémon around. It was captured by Ash and released back to its homeland.